Our interdisciplinary STEAM (science, technology, engineering, art, and math) curriculum is a core part of learning at Westridge, but this philosophy comes to life in the STEAMWork Design Studio - a space for students to create, invent, and build collaboratively using 3D design software, laser cutters, and more. 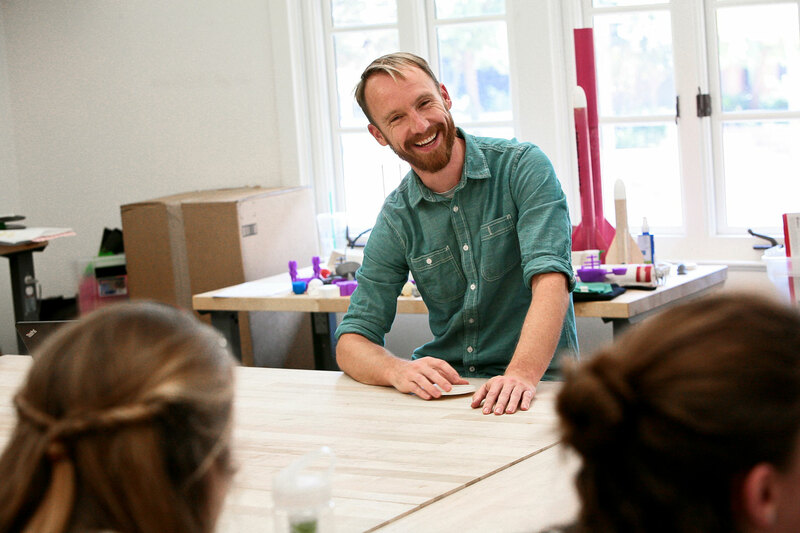 In this Q&A, find out why Upper School Art Teacher and STEAMWork Studio Coordinator David Prince believes in cultivating curiosity in and out of the classroom. As the STEAMWork Design Studio Coordinator, what are some of your goals for students in that space? I think the STEAMWork Studio is important for students because it provides an opportunity for students to make connections between different disciplines through making. Students might use a combination of what they've learned in math, physics, and art to design a 3D-printed project. There has also been research showing that when students have a tactile engagement with their work, learning sticks better, and they remember the associated information better. My philosophy for the STEAMWork Studio is to put students in positions where they have to figure out what the best tool for the job is, so that they’re thinking about not just how to use the tool, but about problem-solving. I teach 3D Design and Rocketry. I’ve taught a number of different classes throughout my time at Westridge from Ceramics to Drawing & Painting, but I created the 3D Design class partly because we’d never had a sculpture class. It also coincided with the STEAMWork Studio [opening in 2015], so we could take advantage of that. The 3D Design class is a mix of technology and hands-on work; we do a lot of woodworking, and working with plaster. For Rocketry, I teach the class, but I’m more of a mentor because the class is very much student-driven. Rocketry was started by a student here, and there’s a structure of team captains and teams, and they get out of it what they put into it. (Editor’s note: Which is a great deal! The past 2 years Westridge teams have qualified for the National TARC competition, placing them within the top 100 teams in the country.) I help them learn the tools that they need, and they do use 3D printing technology a lot, as well as hand tools and the laser cutter. How has your background in sculpture and art informed your teaching style? I don’t think I knew I was going to do art until probably my junior year of college (Editor’s note: David went on to receive an MFA in sculpture from the School of the Art Institute of Chicago). I feel like I chose art because it’s the most open-ended thing. You can do science as art. You can do almost anything that you’re curious about in the realm of art. But I was well into college before I realized how expansive [the definition of art] is. And I think that’s what I bring into my teaching – I try to expand the world of what art is or could be. In my work, I’m constantly using different materials and exploring different topics. I’ve heard [my style] called “project-based art,” which is interesting because project-based learning is also a teaching method. [Project-based art] means choosing a topic that you’re interested in and then diving into it and pursuing it, and having something come out of that exploration process. How has Westridge been a place where you and your students can cultivate curiosity? Cultivating curiosity is the thing I’m most interested in in the classroom. My teaching style is often to try to learn with the students. I’ll come up with a new project and I’m trying to figure out the answers with them; I think I have a lot of expertise, but I’m more interested in the process of learning and figuring things out. I think teaching that process to students helps them learn how to make connections and ultimately understand that the world isn't divided into disciplines, and that what they're learning in different classes can be applied to all kinds of situations and problem solving. What have been some of your favorite projects to come out of your classroom or the STEAMWork Studio? I really like the 7th grade 3D-printed boat project that we’ve been doing since the lab started; it’s a great project because students first learn a lesson in physics about stability, center of gravity, and center of buoyancy, then they have to apply that knowledge to a boat design. It taps into the full cycle of engineering and design thinking – where students get to learn by testing and retesting their prototypes. I recently had the opportunity to do an aqueduct project with Becca Marcus’s class 7th grade Service Learning class. (Editor’s note: Students had to move water from two buckets into a designated planter using PVC pipe, pool noodles, dowels, and a water pump.) That was fun because there were all these elements of problem-solving and the girls were so amped up about it! They were building something on the spot, which was different; a lot of projects have involved more planning, and then executing it over time, whereas this one was like, “Here’s a bunch of materials, try to make this thing!” It was frenetic - in a good way! 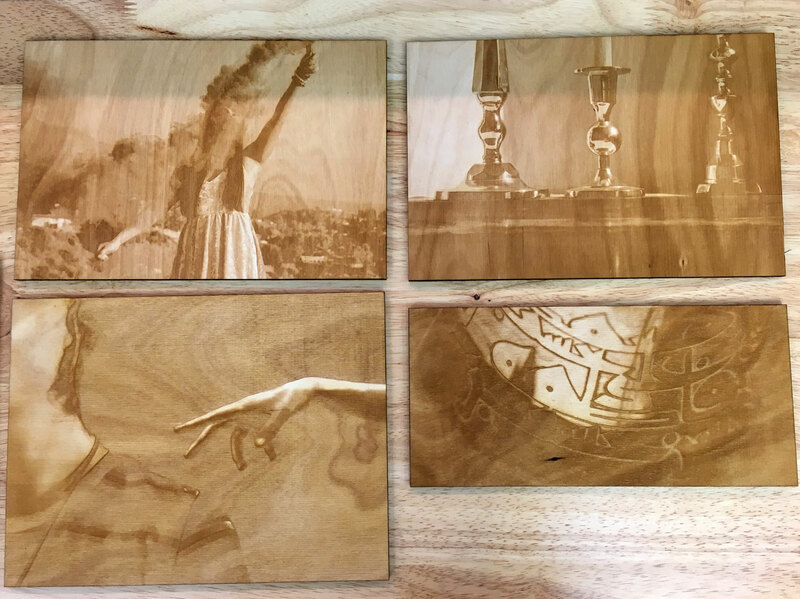 In the Upper School, we’ve had a cool photography project in Katie Sivers' class with students taking advantage of the laser-cutter. I couldn’t have imagined how beautiful and subtle they would turn out. The students have really made use of that machine in a unique way, etching away the material to create a kind of topographical image with the contrast of the burned and the not-burned wood. Right now, Barbra Chabot’s 8th grade STEAM Projects class is exploring the frequencies of sound waves, and they are making musical instruments in the STEAMWork Studio. You could start with the physics of what a soundwave is and how it’s created, but I like coming at it from the other side where it’s like, okay, we’ve all played these musical instruments, but how do they even work? I really like entering science through experience. David holds a B.A. from Colorado College and an M.F.A. from the School of the Art Institute of Chicago. He joined Westridge full-time in 2014, but previously taught Upper School ceramics and summer school part-time at Westridge. He runs Adjunct Positions, a gallery and project space that has been written about in Los Angeles Magazine and the New York Times, out of his home in Highland Park.